This talk happened April 10, 2018 at the Boundless Love Project’s Group Meditation. Before listening to the talk, we suggest you listen to this guided joy meditation, which preceded the talk. Octavia E. Butler was born on June 22, 1947. Her mother, Octavia Margaret Guy, worked as a housemaid. Her father, Laurice James Butler, shined shoes. They were an African-American family living in Pasadena, California. In 1947, racial segregation and discrimination legally reigned in the USA. People and institutions showed open hostility towards black people. During Octavia’s eighth year of life, fourteen-year-old Emmet Till was beaten, mutilated, and murdered in Money, Alabama for allegedly talking to a white woman; Rosa Parks was arrested on a bus in Montgomery, Alabama for refusing to give her seat to a white passenger; and Dr. Martin Luther King Jr.’s home was bombed by segregationists. Due to the effectiveness of the civil rights movement, when Octavia was 12, President Eisenhower signed into law the Civil Rights Act of 1960. This was yet another attempt to enfranchise black and minority citizens who were de facto prevented from voting. Yet every success for civil rights resulted in Klansmen, white supremacists, and segregationists responding with more violence and hostility towards black people. When Octavia was 15, 47-year old civil rights leader, Medgar Evers, was assassinated by a Klansman outside of his home in Jackson, Mississippi. When Octavia was 16, segregationists bombed a black Baptist Church in Birmingham, Alabama, killing four girls age 11 to 14, and injuring over 20 other Sunday service attendees. When Octavia was 18, President Lydon B. Johnson signed the 1965 Voting Rights Act into law, in yet another attempt to ensure black and minority citizens in every state the ability to vote. When she was 21, Dr. Martin Luther King Jr. was murdered while standing on the balcony at the Lorraine Motel in Memphis, Tennessee. As both a black person, and as a female, the cards were stacked against Octavia. It didn’t help that at age seven, her father died, and that she suffered from dyslexia, which made it difficult for her to read and keep up in classes. Because her dyslexia was not diagnosed until she was 13 years old, many of her teachers branded her stupid and lazy. Despite all of these personal and cultural obstacles, Octavia E. Butler had a passionate, unstoppable drive to become a writer. Her mother had read to her regularly and helped her learn to read. Her mother believed passionately in books and education, and would bring Octavia all of the books her employers threw away. The public library became Octavia’s second home. At age 10, Octavia started writing stories and begged her mom to buy her a typewriter so she could type her manuscripts. From writer’s magazines she found at the library, she learned how to submit her stories for publication to magazines and book publishers. Octavia had what she later described as a “positive obsession” to write. One way or another, she was going to write, and she was going to make a living at writing. When you keep going despite obstacles, setbacks, doubts, and suffering; despite all of the evidence that declares it cannot be done; despite all of the naysayers who assert you cannot do it, that is the beautiful quality of persistence. Persistence can also be thought of as grit. Resolve. Determination. Commitment. Fortitude. Perseverance. Tenacity. Because Octavia E. Butler so embodied this quality of persistence, her life and work will be one of our running examples through today’s talk. In addition, I will also talk about this quality of persistence in how it relates to our meditation and mindfulness practice. The same is true for meditation. At the beginning there is a lot of doubt as to whether you are doing it right, confusion on if it is helping, restlessness over the slowness of the process, and impatience to see results. You can’t walk before your crawl, and you can’t become proficient in meditation, or anything else, unless you confront the awkward and mentally uncomfortable process of learning and practicing the activity. Let’s look closer now at the obstacles that persistence overcomes. Persistence continues when everyone around you says you can’t do it. Teachers, family, publishers, and other people, in both subtle and overt ways, told Octavia that she would never be a writer. My aunt and I were in her kitchen, talking…. “I want to be a writer when I grow up,” I said. “Writing will be my job,” I said. I was most adamant when I didn’t know what I was talking about. In all my thirteen years, I had never read a printed word that I knew to have been written by a Black person. My aunt was a grown woman. She knew more than I did. What if she were right? Even when everyone tells you, you can’t do something; even when all of the evidence asserts you can’t do something; persistence is the ability to follow your heart despite all of the critics and all of the evidence. Octavia chose to write mostly science fiction and fantasy stories. She explained her choice this way, “I’ve often said that since my life was filled with reading, writing, and not much else, it was too dull to write about. I still feel that way.” Before her, there had never been any evidence of another black woman writing fantasy and science fiction. It is a challenge to do something that nobody else “like you” is doing. Consider our meditation practice. Most of our cultural conditioning tells us that to be successful and happy, we need to achieve, acquire, and accomplish important things. Few of our friends, or the people we know, actually meditate. As a result, our conditioning creates an ego-driven, internal monologue of why we don’t have time to meditate, why meditation is not as important as a variety of other things, and why we don’t need to meditate. When your own thoughts are the naysayers, persistence is to be mindful of this internal dialogue, recognize it as egoic, and meditate anyways. Persistence overcomes naysayers, even when the naysayer is our own ego. Persistence also continues through difficult, painful, hard, scary, and challenging circumstances. Because novels can take years to write, Octavia tells other writers, “…there will always come a time in writing a novel …when you don't think you can do it. Or, you think it's so bad you want to throw it away…. you want to either burn it or flush it. But if you keep going… that's what makes you a writer instead of an 'I wish I was a writer.'" Because Octavia had virtually no income from writing, she had to work other jobs. Even when the going gets hard, difficult, painful, and unbearable, you keep going. That is persistence. In an article where she shares advice for writers, she wrote, “Write. Write every day. Write whether you feel like writing or not. Choose a time of day. Perhaps you can get up an hour earlier, stay up an hour later, give up an hour of recreation, or even give up your lunch hour.” That is the commitment of persistence. Meditation and mindfulness liberates our true self from the confines of our ego. Our egos work like a cage that imprisons us. The bars of this cage are created by our fixed-views and other delusions. Mindfulness encourages us to experience those cage bars, to touch them, to shake them, and get to know them well. But when we touch the bars while the delusion of self-view is active, it’s as if the bars are electrocuted, and we suffer, making this a painful process. But the way out of suffering is through. The more we mindfully get to know these bars, at some point, we see through their illusion, and magically they dissolve away. “We’re finally free,” we proclaim, only to discover the egoic cage works like a nested doll. We find ourselves now trapped inside a slightly larger cage where we need to repeat the process again. Persistence keeps us moving forward in spite of the suffering, hardship, difficulty, and seemingly never-ending cages. Octavia’s advice for writers applies equally to meditators: Meditate every day. Choose a time of day to meditate. Sacrifice less important activities if you have to. Make the time you meditate sacred. Guard that time, protect it, and use it for its intended purpose. Meditate whether you feel like meditating or not. The work of liberating ourselves from our ego can be difficult and gut-wrenching. Yet each successful prison-break helps us shed needless ego-inflicted suffering, gives us a little more freedom, and makes the world a more peaceful and loving place. Doubt is normal. Let your habit of meditation pull you through these times of doubt. Keep meditating anyway. Develop that habit of meditation that will keep you meditating through the darkest times, and the worst of times. Octavia wrote stories, submitted them for publication, and received rejection letters year after year, after year, after year. Without any guarantee that anything she wrote would ever be published, she just kept writing and submitting her stories to publishers. That is persistence! Most of us would have given up, but Octavia, kept writing and submitting stories. She did not get her first story published until she was 23 years old. That may seem young to us, but by then she had been writing for thirteen years. After that, she again received rejection letters year after year after year. It took another five years of writing and submitting stories before the publication of her next story, which was a novel. Persistence keeps going, even when you see no progress, even when there is no hope, even when your efforts bear no fruit. Yet all of those years of effort made Octavia a better writer, allowed her to hone her craft, fail in numerous ways, and learn from those failures. The same can happen in your meditation practice. You seem to reach a plateau, and stop seeing benefits for weeks, or months, or years. No dramatic, visible changes happen. Or maybe the progress you’ve made evaporates and you seem to backslide. This too is part of the path. If this happens, first, talk to a meditation teacher to make sure you fully understand the technique and are doing it correctly. If you are, then just keep plugging away. A lack of visible change, or backsliding, must not encourage you to abandon your meditation practice. During these stagnant times, you learn patience, persistence, fortitude, and how to let go of greed, grasping, and needing results. If you don’t see the benefits in your daily life, know the benefits are happening on a subconscious level, helping to untie deeply buried egoic conditioning. Then, after a long period of what seems like stagnant practice, one day, for no apparent reason, you miraculously make great gains without any effort. Of course, like Octavia with her writing, these gains result from your continued and consistent meditation during the times when you did not experience any benefits. Now that we know what persistence looks like, what fuels it? It turns out all four kinds of love fuel persistence. All of us are blessed with unique skills, knowledge, talents, or passions that bring us joy. This joy fuels our persistence. Octavia loved the creativity and imagination of writing. When she was little and teacher’s condemned her, fellow student’s harassed her, and relatives insulted her, she found refuge, play, peace, and joy in her big pink notebook where she could become a “…magic horse, a Martian, or a telepath” in any place or time. Joy fuels our meditation too. The peace, relaxation, ease, and joy of meditation often encourages us to meditate. The joy of having a new, more skillful way of relating to our thoughts encourages us to meditate. The joy of living a more loving, peaceful, and joyful life encourages us to meditate. When we have a talent, and we use that talent to enrich, inspire, and benefit others, that talent can be fueled by kindness and compassion. Therefore, kindness and compassion fuels our persistence. Kindness seeks the happiness of others. Compassion seeks to relieve the suffering of others. Thus, kindness and compassion for all life, fuel our ability to persevere in our skillful actions. Being an avid reader, Octavia noticed how most of the heroes of science fiction and fantasy stories were white males. She wrote herself into her stories. Most of her protagonists were black females. She wrote amazing, complex, creative, and thoughtful stories that fostered empathy and understanding between races and genders, while empowering women and people of color. She spread a message of love and compassion through her writings. Her writing routinely modeled how empathy and understanding could overcome hierarchies to create reconciliation, peace, and respect between all people? Her stories cultivated empathy for all outcasts, be the outcasts vampires, aliens, black women, slave-holding white people, or incestuous siblings. On top of using her stories to promote love, she wrote with a loving intention to use the money she gained from her writing to serve life. In her journal, her stated goals for writing included helping poor black youth broaden their horizons, go to writing workshops, and attend college. She also sought to provide the best healthcare for her mother and herself. Kindness and compassion fuel our meditation practice too. We wish for our own happiness. We wish to end our suffering. We wish to be more skillful for the benefit and welfare of all life. These skillful intentions, allow our kindness and compassion to drive our meditation practice during good times and bad. Due to our lawful, yet constantly changing reality, any skillful effort to use our gifts to serve others will encounter difficulties, hardships, setbacks, doubts, and other challenges. The more peace and equanimity we can bring to these difficulties, the less suffering they cause us, and the more easily we can pursue our goals. In this way, peace feeds our ability to persevere. From this perspective, she was taking the rejections personally with a lot of self view, and it caused her pain. Later in her life, she had this to say: “Rejections are painful, but inevitable. They’re every writer’s rite of passage.” By considering rejections an “inevitable,” “rite of passage” Octavia depersonalizes them. All writers get rejection slips. Why make a fuss over them? Why get upset over them? In this way she is bringing more peace and ease into her life around these unavoidable circumstances, and that peace aids her ability to persist. Peace also fuels our meditation. Through meditation we start to bring peace into more and more of our life situations. We see how things that used to upset us, cause us fear, or make us angry, no longer do, or they do to a lesser degree. Calmness, peacefulness, skillfulness surrounds our behavior. The peace we experience in our life motivates us to keep going. It gives us faith in the practice. It gives us more freedom, and more resolve to keep rattling our cage bars. All four kinds of love fuel persistence, but like other virtues, persistence has its near and far enemies. The near enemy of persistence is stubbornness. Where persistence has an open, spacious, willing-to-learn mind; stubbornness clings to fixed views, and has a narrow, constricted, mind that refuses to learn or listen. Persistence arises from our true self. As such, it filters communications from others. It mindfully sees the judgment, hostility, and other delusions in their words, recognizes them as egoic, and calmly ignores that, while still extracting any wisdom or constructive criticism that may help you succeed in your efforts. For example, if your writing professor reads your paper and tells you, “You are too stupid to be a writer given your abysmal grammar and spelling. You’re hopeless.” You ignore being called stupid and hopeless, for they are the delusion of judgment. You ignore the implications that you will never be a writer, because that is the delusion of futuring. Yet you do hear that your grammar and spelling need improvement. Because you seek to be a better writer, you take appropriate actions to remedy that. That is how mindfulness sorts the wheat from the chaff, while remaining calm and unruffled. Persistence knows what’s vital to the success of the mission, and what’s flexible. Octavia sought to be a professional writer. Getting paid for her writing was essential to her success. Everything else could be compromised. She would work other jobs and write part time. She would take college classes and attend writers’ workshops. She would learn from other writers. She would read good and bad writing and learn from them both. She would continue to submit her stories over and over and endure years of rejection slips. This kind of flexibility showed she avoided the near enemy of stubbornness. The far enemy of persistence is procrastination; putting it off, doing it later. Are you procrastinating? Then mindfully investigate your intentions and mental attitudes towards the task. Are you clear about who or what you are serving through your actions? This will help to bring in the fuels of love and compassion. Can you let go of your fears of failure, and concerns about the results, and simply do the best you can do right now? This will help you bring in both joy and peace. In 1978, at the age of 31, Octavia E. Butler finally made enough income from her writing to quit her other jobs. Through persistence, her dream became reality. During her lifetime, she published 14 novels and many short stories. Her writing eventually earned her enough money to pay off the mortgage on her mom’s home. She was a best-selling author who won numerous awards including two Hugo Awards, and a Nebula Award. She was the first science fiction author to receive a MacArthur Fellowship in 1995. In 2000, she received the PEN Lifetime Achievement Award. In 2005, she was inducted into Chicago State University's International Black Writers Hall of Fame. Her persistence paid off. She was able to live as a writer and serve the world through her writings. Octavia’s life begs the question: where do we apply our persistence? Dozens, hundreds, maybe thousands of things vie for our energy and attention. How do we know what’s worthy of our persistence? We all have a primary purpose, which we all share, and most of us have a secondary purpose, which is unique and may change over time. Our primary purpose is to shed our ego and awaken to our loving essence. All wisdom traditions proclaim this to be our highest calling. We respond to this purpose by maintaining a meditation practice, remaining mindful throughout the day, journaling, attending group meditations, spending time in nature, reading uplifting articles and texts, attending meditation retreats, attending places of worship, and similar activities. 3. What we do that skillfully serves others, be those others humans, animals, or the environment. We must listen to our inner voice, and do our best to follow it; even when it doesn’t make sense, even when it is unrealistic, even when it has never been done before. 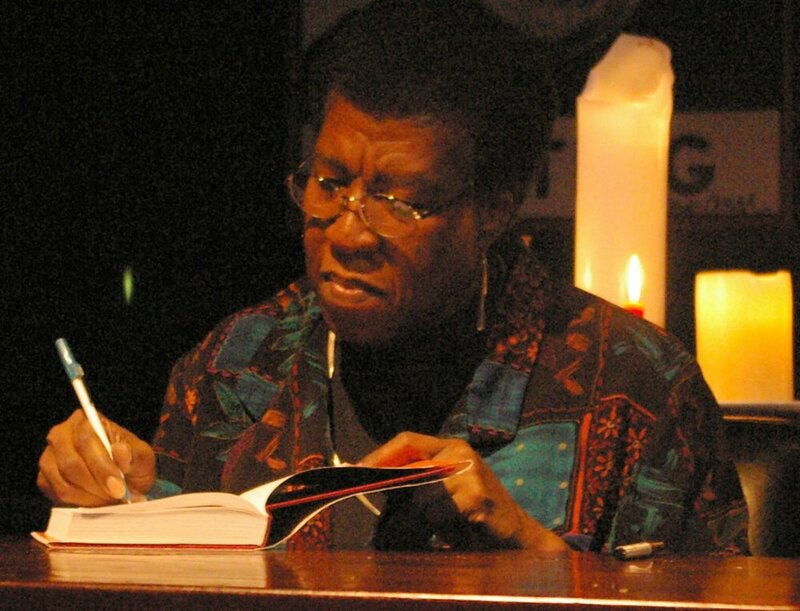 Octavia E. Butler heard her inner voice strongly. It shouted “write!” As a result, millions of us have benefited from her tenaciously and persistently following her inner voice. Persistence overcomes all obstacles, detractors, doubts, difficulties, delays, setbacks and stagnation. Persistence overcomes the far enemy of procrastination. The four kinds of love -- kindness, peace, compassion, and joy -- protect persistence from becoming the near enemy of stubbornness. The four kinds of love also fuel persistence. Use love to bolster your commitment and drive behind all of your skillful actions. Use love to motivate you to maintain a regular meditation practice and to be mindful throughout your day. Octavia understood that when you know your calling, persistence pays. Frequently, persistence outperforms talent, smarts, inspiration, connections, and luck. With persistence, you will accomplish great things, but you will also accomplish them without concern for their fruits. The work itself will be an end in itself. Sometimes when I’m interviewed, the interviewer either compliments me on my “talent,” my “gift,” or asks me how I discovered it…. I used to struggle to answer this politely, to explain that I didn’t believe much in writing talent. People who want to write either do it or they don’t. At last I began to say that my most important talent—or habit—was persistence. Without it, I would have given up writing long before I finished my first novel. It’s amazing what we can do if we simply refuse to give up. I suspect that this is the most important thing I’ve said in all my interviews and talks as well as in this book. It’s a truth that applies to more than writing. It applies to anything that is important, but difficult, important, but frightening. We’re all capable of climbing so much higher than we usually permit ourselves to suppose.